Print a $1.50 off coupon on any two 6.5 oz. sliced or 6 oz. 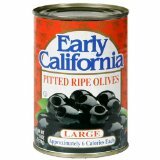 pitted Early California or Pearls Black Ripe Olives. Here’s a deal to get olives at Walmart for only $0.67!